I was curious to see what this anime was like when I saw it a few times whilst browsing through anime, which turned out to be one of comedy and adventure. Hokaze Kon is the main character in Ixion Saga DT (short for Dimensional Transfer), who is sent to another world called Mira whilst in the middle of playing a Monster Hunter parody(?) by a female player who suddenly appears after he fails a quest. This new world is the home of a mystery energy known as Alma. Kon's arrival in Mira is very unexpected for him and for the characters we see in the midst of a battle. From there he escapes with Saingain and co (Mariandel and Princess Ecarlate), who aren't exactly the type of characters you expect (you'll know what I mean as you progress with the anime). Also, Saingain is voiced by a very familiar voice actor who voices a well-known character in Gintama. Kon soon finds himself in the middle of a struggle around Alma after saving the Princess from attackers . 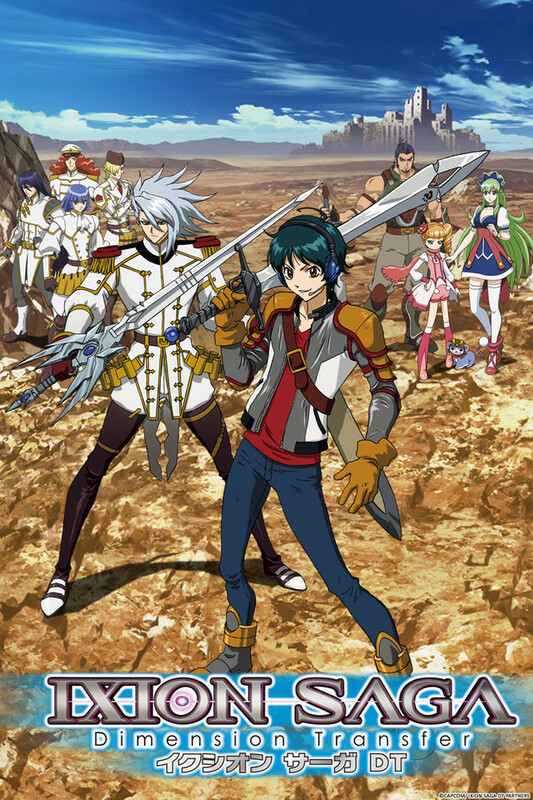 Ixion Saga DT makes for some good lighthearted fun with plenty of action as Kon tries to find his way home whilst trying to get away from the army. The comedy happens during the opening and end credits (at one point Kon is singing the opening song). The anime has quite a mature tone to it as well, but this mixes in well with the comedy which is a bit "hit and miss" at times. It's also a title which you won't be aware of unless it is recommended to you or you stumble across it whilst browsing for some new anime to watch, but is funny and entertaining when you get into it, which makes up for the vague plot. Anything else? : If you ever gain an ultimate attack, don't let it have a long charge.